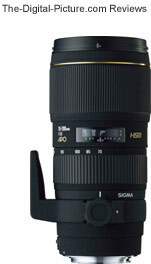 Note: The Sigma 70-200mm f/2.8 EX DG HSM Lens has been replaced by the Sigma 70-200mm f/2.8 EX DG Macro HSM Lens. The Sigma 70-200mm f/2.8 EX DG HSM Lens contains a very popular and functional focal length range in a very well built, well-featured and well-performing package. I have purchased 2 copies of this lens. I returned the first one to the retailer because it front-focused significantly. I decided to take another route when the second lens showed a similar problem - I returned the lens to Sigma for warranty service twice in attempt to resolve the problems I'm having with it. My current Sigma 70-200mm f/2.8 EX DG HSM Lens lens is front-focusing on my Canon-calibrated Canon 1Ds Mark II at focal lengths below 135mm. Sigma's last service attempt improved AF accuracy, but it is still not close to being acceptable to me. The test ISO chart shots and other comparison tests I made utilized manual focus exclusively for the results below 135mm. The other problem that Sigma has not resolved is that this lens is sharper on the left side than on the right 1/3 of the frame at and above 135mm. I can't tell you which is normal and which is exceptional, but Sigma apparently believes it is within spec as they had two chances to fix it so far. Since the non-center ISO test chart crops are utilizing the right side of the lens, the displayed results show more softness than is present in the left side of the frame. That's right - I have good image quality but manual-focus-only below 135mm and accurate autofocus but poor image quality above 135mm. Can't win. This lens has cost me a lot of time - I need to move on. Since the Sigma 70-200 DG has a very small magnification value (especially at the widest focal lengths), I was not able to completely fill the frame for the 70mm and 85mm ISO test chart photos. A 12mm Extension Tube (the smallest I have) was too much extension - I could not focus from a far enough distance to fit the test chart in the frame. I shot the test photos from the closest native focus distance possible and cropped them from the standard locations. Thus, the detail in these crops is smaller - and - the non-center crops are taken from closer to the center of the lens (giving a small advantage to this lens). Pictured above from left to right are the Canon EF 70-200mm f/4 L USM Lens, Sigma 70-200mm F/2.8 EX DG HSM Lens, Canon EF 70-200mm f/2.8 L USM Lens and Canon EF 70-200mm f/2.8 L IS USM Lens. The three f/2.8 lenses are shown with Wimberley Lens Plates attached to their tripod rings. The Sigma is shown with a model P-10 attached, but a P-20 is probably a better choice. The Sigma 70-200mm f/2.8 EX DG HSM Lens is very sharp in the center (even wide open) through the mid focal lengths of the lens - Even competing well with Canon's renowned counterparts in the center of the frame at these focal lengths. At longer focal lengths and especially at 200mm, my test results and real-world experience show the Sigma needs f/4 to produce excellent center results. As I mentioned before, the right 1/3 or so of the frame is very soft (dreadful) on my copy at the upper focal lengths. Results from the left side of the frame are very good and compare well to the Canon counterparts. Color and contrast are also comparable to the Canon 70-200 Ls - very good. Background blur from the 9-blade aperture is nice. CA is well controlled. Flare is not well controlled in the higher focal length range. At 200mm, bright lights and the sun need to be far out of the picture to avoid contrast-robbing flare. My exposures are averaging about 1/3 to 1/2 f-stop too bright when compared to the three current Canon 70-200 L variations I have. Nothing unusual shows up in the distortion department. The Sigma 70-200 DG shows some barrel distortion on the wide end flowing into pincushion distortion at around 100mm until showing moderate pincushion distortion at 200mm. Vignetting results show very little shading until 135mm through 200mm at f/2.8. Only full frame body users will notice this. Canon's similar lenses perform nearly identically in this regard. The same lenses shown with their included-in-the-box hoods. Notice that the Sigma hood is much smaller than the Canon f/2.8 hoods. The Sigma 70-200mm f/2.8 EX DG HSM Lens is compatible with the Sigma 1.4x EX DG and 2x EX DG Teleconverters. Aside a from one f-stop loss for each jump in focal length (1 and 2 stops respectively), the 70-200 shows some expected image degradation with the teleconverters. With the TCs, Sharpness and contrast show a decrease at wider apertures, but performance is good when stopped down one or two stops. The distortion change is very small with the 1.4x and is actually reduced with the 2x attached at 200mm (apparently a small amount of barrel distortion is introduced with the 2x). Some additional CA is more apparent with the teleconverters attached. Overall, the 1.4x is very complementary to this lens, the 2x is less so. Both one-shot and AI Servo autofocus accuracy are very good. Sigma's HSM (Hyper Sonic Motor) is fast and silent. The Sigma 70-200 DG is an internal-focusing and internal-zooming lens . The lens does not change length and the front element does not rotate. No focus distance limiter is present. FTM (Full Time Manual) focus, a nice feature, is supported. A long minimum focus distance of 5.9' (1.8m) yields a low maximum magnification. Like all (all I have used so far at least) of Sigma's EX lenses, build quality is very solid. Zoom and manual focus rings are nicely sized and smooth. 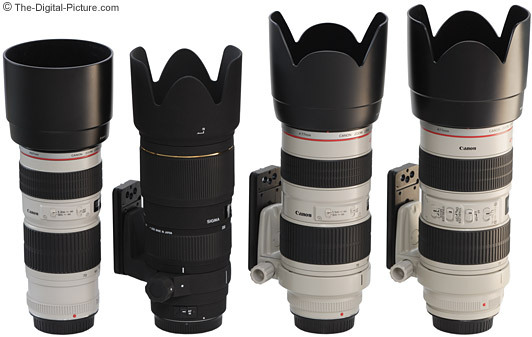 The Sigma 70-200mm f/2.8 EX DG HSM Lens' length (7.2"/184mm), diameter (3.4"/86.2mm) and weight (44.8 oz/1,270g) are nearly identical to the Canon EF 70-200mm f/2.8 L USM Lens' specs. These two lenses even share a 77mm filter diameter. Remember that Sigma's zoom rings turn the opposite direction of Canon's. This is a mid-weight and mid-size lens that can be carried for reasonably long periods of time. I'm not a fan of Sigma's matte finish - I think it shows dust, dirt and marks too easily and feels somewhat cheap. Other's really like the finish - and like that it is black instead of white (gray). Its your call on this one. Like most lenses this size, the Sigma 70-200 DG includes a tripod ring for a better-balanced and more flexible tripod attachment. The Sigma 70-200 ring is notable for several features. First, it has a very low profile. This keeps the lens closer to the tripod head for a lower center of balance and keeps the overall lens size smaller - but it yields less clearance for fingers. The ring definitely gets in the way when shooting handheld. Fortunately, the tripod ring is easily removable and does not require the lens to be removed from the camera body to do so. When in use, the ring is not as smooth to adjust as I prefer. Once again, the same lenses from a different angle. A nice padded black nylon case with a neck strap is included with the Sigma 70-200. The Sigma 70-200mm f/2.8 EX DG HSM Lens is available in Canon (reviewed), Nikon and Sigma mounts. Pentax and Minolta mounts are available in a non-HSM model. You should know that there are some potential issues with third party lenses. Since Sigma reverse engineers (vs. licenses) manufacturer AF routines, there is always the possibility that a new body might not support an older third party lens. There are examples of this happening in the past. Sometimes a lens can be rechipped to be made compatible, sometimes not. Second, there is the risk of a problem that results in the lens and body manufacturers pointing blame at each other. However, Sigma USA's 4-year warranty is far superior to Canon's standard 1 year warranty. If you can get a good copy of this lens, it is definitely worth the price - which is significantly less than the Canon EF 70-200mm f/2.8 L USM Lens counterpart. There are more similarities between these two lenses than there are differences. Would I rather have the Canon? Sure, but the sizeable price difference makes the Sigma the right choice for some. The Sigma 70-200mm f/2.8 EX DG HSM Lens turned in good real world performance. The value is there.